Good Mood Foundation - Who Are We? Hi, my name is Mike Attar and I’m the founder of the Good Mood Foundation. We’re a registered non-profit organization founded in 2005. Our charter is to provide evangelistic and ministerial services to people with mood struggles and that’s exactly what we do. We also believe that getting well is analogous to a three legged stool. A three legged stool doesn’t work unless you have ALL three legs. Each of the three legs plays an important and specific role in the patient’s recovery. Professional Medical and Pharmacological Treatment is the first leg. Recovery Begins Here. Counselors, Therapists and Support Groups are the second leg. They help the patient deal with their “issues” and make personal changes. God is the third leg. “Engaging with God” group connects and reconnects patients to the God of the Bible. A mind filled with negative thoughts and emotions. In group, we provide Biblical solutions to these three issues along with real-life personal stories, uplifting videos, worshipful singing, giving away of books, personal prayer, notes of encouragement and hugs. Group is facilitated by “peers” who have a passion for ministering to their “peers” with mood struggles-NOT professional Christian counselors. To date (July, 1, 2013) we’ve conducted “Engaging with God” group over 75 times and ministered to well over 500 patients. “Engaging with God” really starts on Sunday morning when I meet the patients and tell them about group. We also distribute 15 “sets” to the patients. 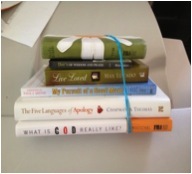 A set consists of a Bible and four or five additional books rubber banded together. We provide “sets” because MOST patients are in a place in their lives where they are OPEN to making personal changes. Godly-Christian books play a part in that process. Patients enjoy reading because they have no Internet, computers or other distractions. In addition to the “sets” I also leave a box of cookies for the staff each week, too. In the afternoon, before group my volunteer and I pray over each chair and for the patient who will sit in it. Then we go the patient ward and listen, answer questions and make the patients comfortable about trusting us enough to come to group. Then we gather the patients and then go to the cafeteria and “Engaging with God” group begins… At the end of group we pray for each patient and then give each a hug saying, “I believe you are going to get well.” We also provide our telephone numbers if the patients want more prayer or a personal visitation. After group the patients can then help themselves to additional books on our resource table. 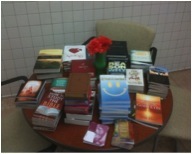 On average we give away 30-40 books each week from our resource table. Each patient who attends group fills out an evaluation. To date, the majority of the patients indicate that their mood went from sad, unhappy and despondent (before group) to happy, encouraged and joyful (after group). It’s my belief that the shift in mood occurs for three reasons. They hear from God’s Word in conjunction with moving stories and videos. We have a number of relevant PDF files that will help you get to know us better. You can find these files in “Supporter’s Vault.” Files include our “Ministry Folder” and patient workbook and others… “Support’s Vault” is password protected. So if you would like the password. Please tell me who you are and how you found us and I’ll provide a password for you. Finally, if you have any questions about this ministry, please feel free to contact me at MAttar@GoodMoodFoundation.org.